Breaking News: Putin to Run for Reelection! Vladimir Putin tells delighted automotive workers that he will indeed run for another six-year term as president of Russia. 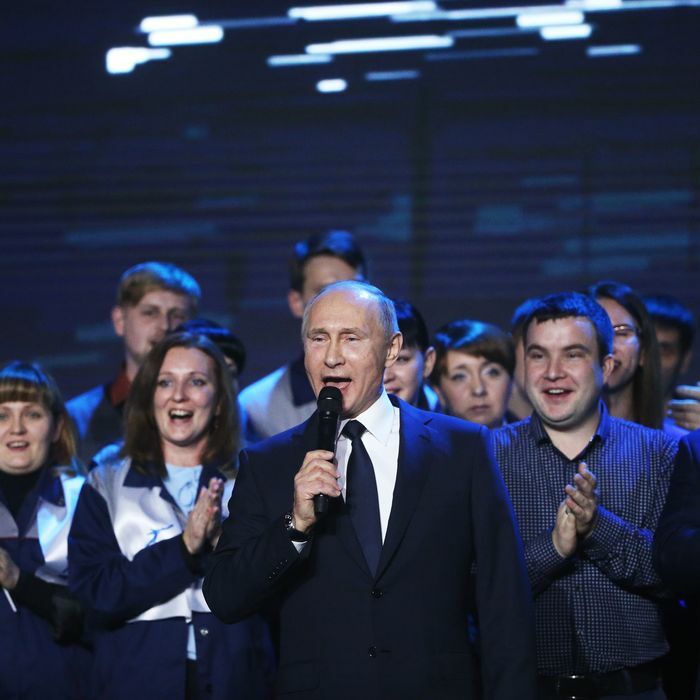 In a shocker, the de facto ruler of Russia, Vladimir Putin, has announced he will offer himself for another six-year term as president in another election where serious opposition will not be tolerated. Despite the apparent voter apathy, a 49-point lead is a pretty good cushion for Putin, and that’s without taking into account the, er, resources he might bring to bear if a real opponent emerged. The one source of controversy over Putin’s candidacy would appear to be the question of whether and when he will eclipse Josef Stalin as having the longest-serving period of unquestioned power in Moscow. Putin has been the dominant figure in Russia since his first election as president in 1999 (he was prime minister from 2008 until 2012, but no one doubted who was in charge). By one reckoning, Stalin ruled his country from the mid-1920s until his death in 1953, a stretch of nearly 30 years. By another, though, his rule began in 1929, when his last rival, Nikolai Bukharin, was expelled from the Politburo. According to that standard, Putin’s reign will outstrip that of the Great Helmsman before his next term expires in 2024. We should know by then if his list of nationalist accomplishments will ultimately include subverting the U.S. elections of 2016.